Nearly a dozen blocks of Madison Avenue in Manhattan and its surrounding areas were resplendent with the Indian tri-color flag at India Day Parade. The diversity of India and the Indian diaspora was in full display at the annual India Day Parade in New York City on August 20, 2017. 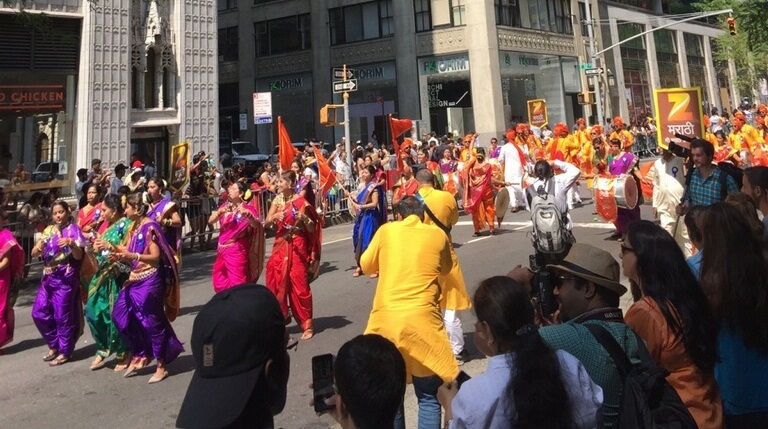 The diversity that India and the Indian diaspora bring to the milieu of New York was in full display Sunday afternoon on one of the prominent avenues of Manhattan. Thousands of people of Indian origin, mostly from New York, New Jersey and Connecticut, gathered, marched and celebrated India’s 71st Independence Day with passion, gaiety and color. The diversity within India was noticeable too, as tableaus, costumes and music from the multitude of regions of India were showcased. Not to mention the presence of stars from the Telugu blockbuster Bahubali. On what could be described as the perfect day to be outside, the Indian diaspora community of New York and vicinity showed up in full strength to mark and celebrate the Independence Day of India, continuing a tradition initiated in 1981. Nearly a dozen blocks of Madison Avenue in Manhattan and its surrounding areas were resplendent with the Indian tri-color flag. Chants of Vande Mataram, Jai Hind, Bharat Mata Ki Jai echoed through the streets as the marchers danced and celebrated alongside the tableaus, reflecting the cultural diversity of India and highlighting the key diaspora organizations in the tri-state area. 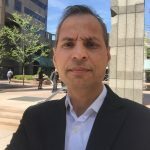 The expressions of the onlookers who were not of Indian origin – but either happened to live in the area or were visiting, was a combination of surprise, amusement and delight. I must quickly add that several people not of India origin had come specifically to be a part of the festivities. The vibrant colors of India will surely bring a smile on anybody’s lips. Couple that with the upbeat desi filmy music and you could see a few bodies already moving to the rhythm. Any talk of diversity is not complete without a quick reminder of what happened in Charlottesville recently. I have lived an hour east of Charlottesville for the last two decades and coincidentally was in Charlottesville a day before the now infamous march. I usually never miss the opportunity to pop into Charlottesville to get the always just-out-of-the-oven bagels at Bodo’s bagels. I had taken along friends who were visiting Charlottesville for the first time and shown them around the amazing university town in the shadow of the beautiful Shenandoah mountains. Back at the India Day Parade, New York city Mayor Bill de Blasio, holding the Indian tri-color, extolled the virtues of diversity and welcomed the “contribution” from every kind of individual regardless of race, language, ethnicity or background. If only, everyone extended the same kind of welcome, everywhere, all the time!